Heading into the 2014 offseason, the most obvious “team need” in the NFL was Kanas City’s at wide receiver. Their lineup consisted of an increasingly sluggish Dwayne Bowe, injury-prone Donnie Avery, first-round bust A.J. Jenkins and 2012 seventh-rounder Junior Hemingway. The 2014 draft had offered one of the richest, deepest wide receiver classes in history. And so more than a few heads were scratched when the Chiefs brain trust of head coach Andy Reid and GM John Dorsey passed on taking a receiver. They went into the season with the league’s most lackluster collection of wideouts, and it played out exactly how you thought it would. Worse, actually. Not a single Chiefs wide receiver caught a touchdown in 2014. There are more than a few teams that couldn’t achieve such destitution even if they for some reason tried. How much of a problem is this? In the big picture, it’s at least a moderate one. Let’s not overthink things too much. In the NFL, wide receivers are increasingly important and if yours aren’t scoring touchdowns, your offense isn’t maximizing its success. Acknowledging this, Reid and Dorsey finally moved to correct the situation this past March, signing a legitimate upper-tier starter in ex-Eagle Jeremy Maclin ($55 million over five years). He’ll replace Bowe, who was released (and latched on with Cleveland). Besides drafting developmental projects Chris Conley in Round 3 and Da’Ron Brown in the seventh, little else was done to fortify Kansas City’s still very average receiving group. But that’s O.K. When your quarterback is Alex Smith, it doesn’t make sense to dedicate significant dollars and cap space to wideouts. Smith is not a flame-throwing playmaker like an Aaron Rodgers, an Andrew Luck or a Joe Flacco. He is a meager-armed athlete who moves well overall but doesn’t command games from the pocket. Pardon the football slur, but Smith is a caretaker. You don’t want to dedicate major cap space to targets a caretaker is unlikely to fully use. Maclin is a very good receiver, even excellent at times. But defenses aren’t going to construct entire game plans around the seventh-year pro. And neither will Reid. In his third season with the Chiefs, Reid has built a brilliant, user-friendly offense tailored to his quarterback’s strengths and weaknesses. And Smith has rewarded his head coach by running the system exactly as designed. For a coach who sleeps at the office, scheming until the wee hours of the morning, there’s nothing better than stability under center. Reid’s plays are usually constructed for Smith’s initial option to be clearly defined. Smith has the intelligence to drop back and make full-field reads. But punctuating these reads usually demands a strong arm and quick trigger finger. Again, not his game. So, in Kansas City, Reid’s West Coast-intensive system has been built largely on screens, single-high zone coverage beaters and misdirection concepts. To help ensure they get the static, predictable defensive looks that many of these tactics exploit, the Chiefs operate a lot out of base personnel or unbalanced formations. • Q&A WITH LEN DAWSON: The Chiefs’ Hall of Fame quarterback and MVP of Super Bowl IV wants the Lombardi Trophy back in Kansas City—in more ways than one. They have all the right types of pieces for this sort of puzzle. Running back Jamaal Charles is terrific on the perimeter, augmenting the outside zone game that’s so heavily tied to the misdirections. A versatile receiver, he’s also lethal on screens. Down the stretch last season, Charles lost some of his touches to De’Anthony Thomas, the team’s fourth-round pick in 2014. Thomas entered the league as a hybrid running back/wide receiver, much like former Chief Dexter McCluster. In this system, opposing defenses have treated him almost entirely as a third receiver, playing nickel when he’s on the field. (Expect Reid to build some custom “11” personnel run plays for Charles, or underrated backup Knile Davis, to exploit this.) Thomas’s short-area burst, open-field acceleration and sheer speed are also great on misdirections. Many of his touches come on reverses, swing passes and backside screens. Last season it took defenses a few weeks to realize that they needed to specially account for Thomas. This year they’ll be more familiar with the 5-8, 175-pounder but they might not necessarily be more prepared to stop him, for they will also have to pay closer attention to Travis Kelce. Entering his third season and second as a starter, Kelce is on the verge of being a top-five receiving tight end (or better). He can line up anywhere in the formation and beat man coverage, plus he’s shown a knack for locating the holes in zones and exploding out of them after the catch. Few tight ends in the league run as well as he does. 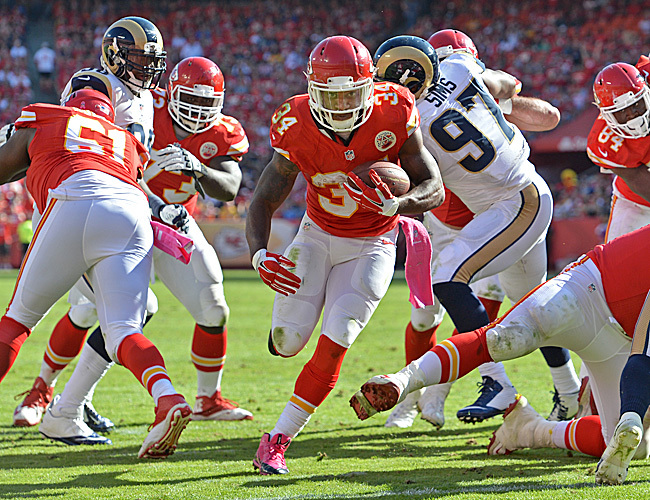 Maclin, with his run-after-catch prowess, is just another piece in Reid’s puzzle. He’s a tough matchup inside or outside. The only difference with him and the other guys is Maclin is not a contributor in the ground game. He won’t run-block as well as Kelce (who, granted, is still learning here), he won’t take handoffs like Charles or be featured on very many jet sweep concepts like Thomas. But that’s fine. There are only so many of those touches to go around. Something unique that Maclin will do for this offense: get the ball in the end zone. • MORE AFC WEST DEEP DIVES: PHILIP RIVERS PLAYS QB IN ITS PUREST FORM: Though he lacks the playoff pedigree, the Chargers quarterback is a top-tier talent who can take an NFL franchise to the Super Bowl. | RAIDERS FINALLY IN GOOD HANDS: after drafting Amari Cooper and signing Michael Crabtree to catch passes from rising star Derek Carr, the Oakland offense might finally be headed in the right direction. 1. Backup running back Knile Davis could easily be a top-10 NFL running back if cast in a starting role. The 2013 third-round pick runs with patience and a controlled quickness, making him great in a north-south game. That’s a nice complement to the east-west style of Charles (who, it should be noted, is a better tackle-breaker than your typical east-west runner). That said, there’s not room for both backs’ talents to be fully utilized. Unfortunately, the rest of the NFL hasn’t seen enough of Davis for a team to offer up a second-round pick or higher for him. 2. Center Rodney Hudson, now a Raider, will be missed. The question is, how sorely? The Chiefs drafted Missouri’s Mitch Morse in the second round with the hope of converting the left tackle into an athletic center who can anchor the O-line on outside zone stretch runs. Hudson’s mobility, here and also in pull-blocking, was huge for a rushing attack that last year ranked 10th in yards per game, and fifth in yards per carry. If Morse can’t make an immediate positive impact, the Chiefs ground game, even with an upgrade at left guard (Ben Grubbs replaces the departed Mike McGlynn) and the anticipated continued run-blocking improvements of left tackle Eric Fisher, will take a step back. 3. Good on the Chiefs for locking down Justin Houston long-term. They had to pay top-market price, but Houston has become top-market player. He has improved steadily each year since being a third-round draft pick in 2011, and not just as a pass rusher (where he was as dominant last season, as his league-leading 22 sacks suggest). He’s stellar against the run, both in terms of setting the edge and pursuing in space. 4. It’s hard to understand the Chiefs’ run defense finishing 28th in yards allowed last season and 30th in yards per attempt. For starters, they had the league’s most athletic and destructive nose tackle in Dontari Poe. They also got solid run-stopping from defensive end Jaye Howard. Houston can set the edge and opposite him, Tamba Hali plays low and is hard to sustain blocks against. Some Chiefs bloggers pinned the problems on fill-in inside linebacker Josh Mauga, but that’s lazy, faulty analysis derived from the assumption that the 2009 undrafted ex-Jet would be a major drop-off from Pro Bowler Derrick Johnson, who tore his Achilles in Week 1. Despite what advanced stats would have you believe, Mauga actually flashed with regularity as a downhill attacker. Maybe the help around him wasn’t always effective, but he usually was. With Johnson back, things could stabilize. Then again, Poe has been sidelined following July back surgery. His absence will really hurt the Chiefs, especially in their speedy but undersized dime package. 5. The first-round selection of cornerback Marcus Peters reaffirms how committed the Chiefs are to playing man coverage under defensive coordinator Bob Sutton. Man coverage allows Sutton to use the full gauntlet of his many high-speed dime blitz packages. The Chiefs have two other high quality corners to go along with Peters: Sean Smith (starting in Week 4; a DUI conviction got him suspended for the first three games) and last year’s third-rounder Phillip Gaines, who was terrific in five starts as a rookie.